During the Great War of 1914-1918, British High Command was convinced that ultimate victory lay in the battlefields of Europe. However throughout the war, Britain’s Imperial armies were active and at times more successful in other theatres far away from the trenches of the Western Front, becoming hardened veterans of desert warfare in the campaigns of Egypt, Palestine, Mesopotamia, Arabia and Persia. Desert warfare presents many advantages for the First World War wargamer. Although it took up- to-date technology (the fun stuff) longer to reach the Middle East than the Western Front, once it did, it didn’t dominate the battlefield in the same way, or cause the same interminable stalemate. Artillery was not the decisive weapon it was on the Western Front. That accolade went to the rifle and the machine gun. At the same time, the Great War in the desert saw “one of the most successful combined operations in the history of modern warfare.” Ships provided more than transport, at times taking the place of artillery and sometimes even spearheading an attack. The aeroplane played an important part in reconnaissance as trenches were regularly dug and abandoned as armies counted advances in hundreds of miles. 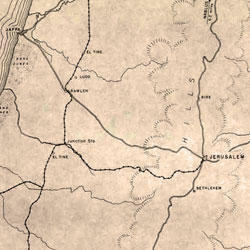 The broad fronts of desert warfare invariably resulted in defending with a flank open, which cavalry and armoured cars could exploit, and did right up to the final days of the war. This is my Great War Blog for keeping track of my 10mm First World War wargames project. My interest in gaming the First World War revolves entirely around recreating the desert warfare of the Middle East. ABOVE The road from Jaffa to Jerusalem. RIGHT After the Great War: T.E. 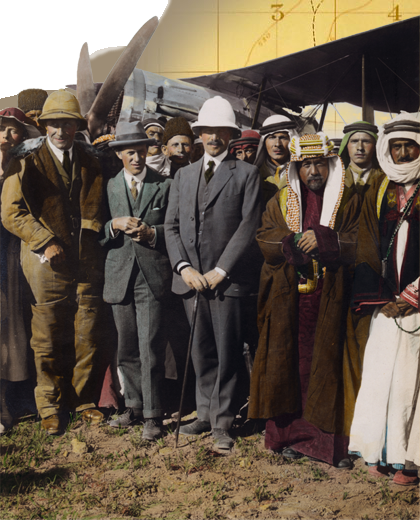 Lawrence, Sir Herbert Samuel and Amir Abdullah at Amman Aerodrome, April 1921.